Background: Natural product, osthol has been found to have important biological and pharmacological roles particularly having inhibitory effect on multiple types of cancer. Objective: The unmet needs in cancer therapeutics make its derivatization an important and exciting field of research. Keeping this in view, a whole new series of diverse analogues of osthol (1) were synthesized. Method: All the newly synthesized compounds were made through modification in the lactone ring as well as in the side chain of the osthol molecule and were subjected to anti-proliferative screening through 3-(4,5-Dimethylthiazol-yl)-diphenyl tetrazoliumbromide (MTT) against four different human cancers of diverse origins viz. Colon (Colo-205), lung (A549), Leukemia (THP- 1) and breast (MCF-7) including SV40 transformed normal breast epithelial cell (fR-2). Results: Interestingly, among the tested molecules, most of the analogs displayed better antiproliferative activity than the parent Osthol 1. However, among all the tested analogs, compound 28 exhibited the best results against leukemia (THP1) cell line with IC50 of 5µM.Compound 28 induced potent apoptotic effects and G1 phase arrest in leukemia cancer cells (THP1). The population of apoptotic cells increased from 13.8% in negative control to 26.9% at 8μM concentration of 28. Compound 28 also induced a remarkable decrease in mitochondrial membrane potential (ΛΨm) leading to apoptosis of the cancer cells. 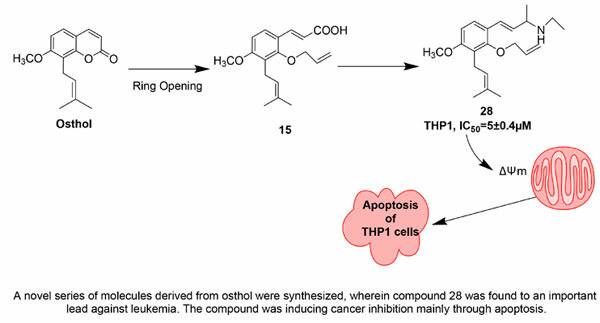 Conclusion: A novel series of molecules derived from natural product osthol were synthesized, wherein compound 28 was found to be most effective against leukemia and with 10 fold less toxicity against normal cells. The compound induced cancer inhibition mainly through apoptosis and thus has a potential in cancer therapeutics. Keywords: Prangos pabularia, Coumarins, Osthol, cell cycle analysis, mitochondrial membrane potential loss, natural products. Keywords:Prangos pabularia, Coumarins, Osthol, cell cycle analysis, mitochondrial membrane potential loss, natural products. Abstract:Background: Natural product, osthol has been found to have important biological and pharmacological roles particularly having inhibitory effect on multiple types of cancer.